It’s Cinco De Mayo! Why not celebrate with one of Mexico’s favorite desserts! 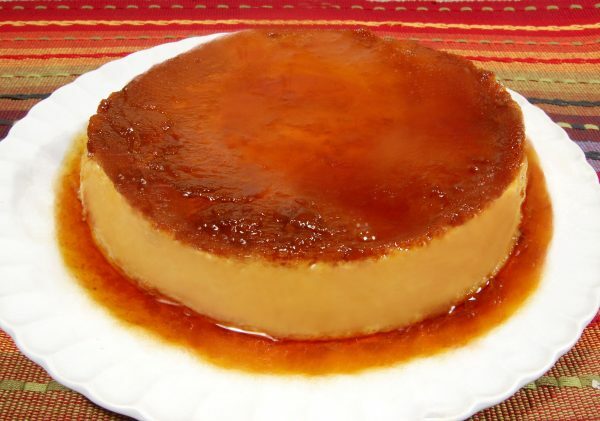 Flan is the delicious creamy, caramel custard that seems to have originated during the Roman Empire, made its way to Spain and eventually found a home in Mexico where it’s been a South of the Border delight for decades. This is the dessert that my aunt, Zia Francesca has always been known for. Thankfully, she’s not one to keep her secret and so her hand-scribbled recipe card has been passed along in our family from one generation to the next. She has absolutely perfected this beautifully basic dessert of sugar syrup cooked to a yummy caramel stage and poured into a mold before adding a rich custard base. It’s then steamed in a bath of hot water until thickened. When cooled, the mold is turned upside down and the caramel settles on top, drips down the sides and settles in a shallow pool of gooey caramel at the bottom of the dish. The recipe is actuall quite simple, using only five ingredients and about one hour of baking time. Rather than whisking the milk and eggs together on the stove, this recipe makes the process much easier by simply mixing the ingredients in a blender. There are hundreds of variations for Flan but I love Zia Francesca’s because it’s “caramely and custardy” and just delicious. You’ll need a smooth mold (ramekins work well if your making smaller, individual servings) so that you can slide your knife around the edge to loosen the custard from the mold. This week I came across a stainless steel utensil called a Flanera in one of our southwestern markets. It’s an actual Flan mold with a lid that allows the custard to steam inside and it’s the perfect size for this recipe. (1.5 quarts) Whichever mold you use, you’re only five ingredients away from Zia’s fabulous Flan! Preheat the oven at 350 degrees. Prepare the caramel. In a saucepan over medium heat, add sugar and a dash of water to moisten the sugar. Melt the sugar in the pan, stirring to avoid burning. Cook until sugar is golden brown in color (caramelized). Immediately, pour caramel into a lightly buttered baking dish or mold. In a blender add milks, eggs and vanilla. Blend until all ingredients are incorporated, about 2 minutes. Pour mixture over caramelized sugar. Pour boiling water into a deep pan and place mold in it. Water level should cover the mold about halfway up. Bake for about one hour. Flan is done when knife inserted comes up clean. Remove mold from roasting pan and place on a rack to cool. Run a knife around the sides of the flan to disconnect from mold. Flip over onto serving plate. The caramelized sugar will form a sauce over the Flan.